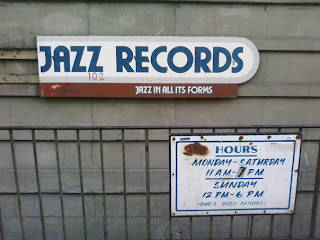 Bud's Jazz Records closed last Tuesday. With great sadness we said goodbye to an icon of Seattle's music scene. It was at Bud's where in 1988 I purchased my first Wes Montgomery (Live at the Vanguard with Wynton Kelly); and did a deep dive into Donald Byrd, Gerry Mulligan, Horace Silver, Stan Getz, Dextor Gordon and so many other jazz greats. I recall fondly the music piped out of the subterranean windows, spilling out onto the sidewalk above calling me to descend Bud's steep stairwell to discover the music. Often, as happened on Bud's last day of operation, I would purchase whatever Bud was spinning-- his taste was always impeccable (last week it was Jay Thomas, Live at Tula's 2002). And the best part, is that each time I play those discs, it transports me back to the very moment of discovery at Bud's surrounded by mountains of vinyl and jewel cases each one holding the promise of a special musical journey that I longed to take. While I am the first to embrace and indeed celebrate the speed, access and choice that digital music delivery offers, I find it hard to believe I'll have depth of emotional connection and memory to Itunes or Amazon the way I will always have to Bud's Jazz Records. Would love to hear memories about "your Bud's Jazz"-- I hope everyone has at least one. Post a comment below.